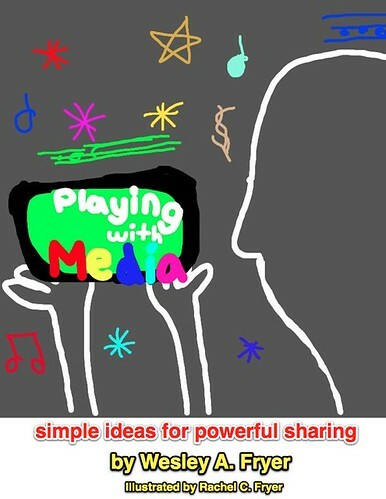 At long last I’ve finished writing my first eBook, “Playing with Media: simple ideas for powerful sharing.” I’m going to publish two eBook versions: a “multimedia EPUB” with 17 embedded videos / screencasts, and a standard eBook version without the videos. E-Ink powered eReaders like Kindle don’t support embedded videos. Lulu has an excellent comparative table showing which eReaders can play different eBook formats. The table doesn’t reflect eReaders which can handle “multimedia EPUBs” versus standard EPUBs, however. I’ve been researching options for publishing my eBook on Apple’s iBookstore, included in iTunes, and have applied for an iTunes Connect Online Account. I don’t know how long that process will take, however, so I’ve also explored some other options. 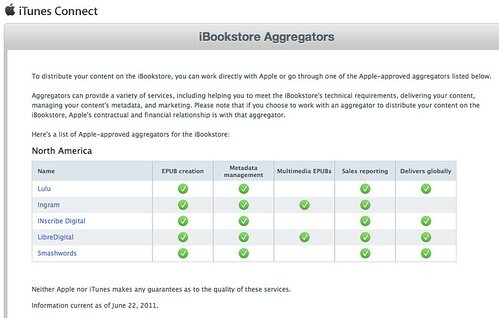 Currently five companies are certified “iBookstore Aggregators” and will (for contractual fees) help you publish your eBook to iTunes. Commission Due to Publisher (for all Devices and Distributor / Agents other than Apple): 50% of the Customer Price payable by eBook Proceeds. The “sale” of an eBook shall occur when an eBook is first delivered to an end user. Commission Due to Publisher when Apple serves as the Distributor / Agent: 55% of the Customer Price payable by eBook Proceeds. The “sale” of an eBook shall occur when an eBook is first delivered to an end user. Basically, LibreDigital wants to keep half my money after Apple takes their mandatory 30%. The terms also specify the Publisher must make (in their portion of the revenue formula) at least $500 per month to receive a check that month from the publisher. This is a stark contrast with Lulu.com, which will pay via PayPal on a monthly basis when you earn more than $5. Lulu.com is the other option I’ve researched the most so far. I’ve talked with both David Warlick and Angela Maiers about their experiences publishing with Lulu, and they have largely been positive. Apple’s Connect Online information indicates Lulu doesn’t work with multimedia EPUBs, however, so I don’t know if Lulu will be an option for me. That may be the reason, when I uploaded my EPUB to Lulu last night, I kept getting EPUB validation errors. These indicated a document size must be selected for PDF conversion, but I didn’t upload a PDF or want one converted. 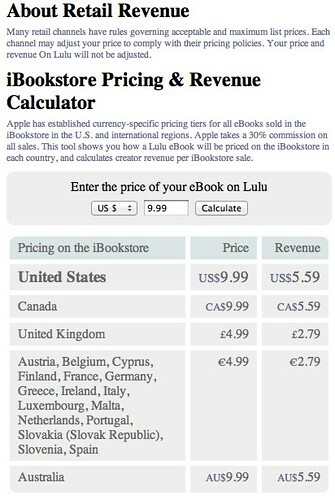 That’s a MUCH better deal, but I’m not sure if Lulu can work with my multimedia EPUB. One of the key services which LibreDigital, Lulu, and other “iBookstore Aggregators” are performing for authors is validating the EPUB formatting of the final digital eBook file. EpubCheck is a free, open source EPUB validation tool but it requires that you run it from a Java command line. That’s beyond my desired geek quotient, so I haven’t used it. If you know of a GUI / simpler interface option for EpubCheck please let me know. Eventually, I’d guess someone will offer complied versions of it like we see with The Gimp / Seashore. Charlene Chausis is a big fan of eBook publishing via ePub Bud. They do have great services (including a free EPUB conversion service) but they don’t offer EPUB validation. They will sell you an ISBN for $5, but they are the owner of record for it instead of you. I am not entirely clear what ramifications that has, but as an author my sense is you want (ideally) to own and control your own ISBNs. I purchased a block of 10 a few months ago from the official U.S ISBN Agency. Check out this blog post for more links and info from Charlene’s eBook roundtable session at TechForum Chicago a couple months ago. At this point I’m not sure if I’ll go with Lulu or LibreDigital for publishing to Apple’s iBookstore. It might be best for me to wait for my iTunes Connect account to be activated by Apple. I’m going to verify if Lulu will handle multimedia EPUBS, and if they do I would like to distribute my books there as well as on the iBookstore. If they don’t I’m not sure about LibreDigital. Their commission prices seem unnecessarily high. I’m concerned that the terms of their default distribution agreement are perpetual as well, rather than limited term. That is a big deal. When you submit a form to learn more about their service, it appears you are electronically agreeing to all their distribution terms as-is. I am not comfortable with this. There is a LOT of fine print. eBook publishing is quite an adventure, as I expected it would be! If you have any bits of advice or thoughts on these alternatives and issues, I’d love to hear from you. As different purchasing options for my eBook become available, I’ll add them to playingwithmedia.com/pages/about. Hi Wes… thanks so much for sharing this. I have been wondering how you were going about ebook publishing as I have watched you describing your forthcoming book in your stream… this is great! Hi Wes: One other question. I presume that your ebook has a lot of visuals and screenshots. I have been considering putting out a couple of ebooks on some ed-tech topics that utilize a lot of visuals but it appeared to me that there was a problem with a lot of ebook platforms when it came to heave visuals. Do you have that problem with your efforts? Did you find any way around it? Since Apple collects and remits sales tax, this is based only on the gross sale price. In this case, sale of a $10 book (or $9.99 under Apple’s structure) would make $5.50 for the publisher, $3.00 for Apple, and $1.50 for LibreDigital. There are no maintenance or per-title fees. The only up-front cost a publisher can incur with LibreDigital is conversion to epub, if such is necessary. I hope this clarification is helpful. Thanks for including these clarifications. I did run into problems exporting to EPUB format from Apple Pages, and learned in the process the EPUB format limits the total amount of data single chapters can include is 11 MB. Pages has a handy “reduce file size” option which I used, and I also ended up moving some content into appendices so they were in “separate chapters” as far as the EPUB requirements were concerned. Pages automatically removes (doesn’t export) images which exceed the 11 MB per chapter limit, so this means in a few chapters only the last 2-3 images were removed. If I hadn’t decided to move some of the content to appendices, I could have worked on reducing file sizes for images or eliminating images. 11 MB is a pretty generous amount for a chapter, so I think the big takeaway here is to chunk your content into more chapters if you run into image size issues. Interestingly the videos you include in an EPUB don’t count against a size quota from what I can tell. My issue now is that the EPUB conversion to Amazon Kindle on the KDP (Kindle Direct Publishing) site did NOT create a table of contents for me. I just learned that a few hours ago. So, I’ll have to figure this one out and replace the copy I have online… EPUB readers automatically create the TOC so it’s not necessary to make one by hand. I’ve read some documentation that gave HTML code to include in your file so Amazon’s conversion would look good, but I don’t know if that will work from the EPUB. So, the learning (as I knew it would) in this process continues! I think it sounds great for you to publish some etech-focused eBooks! I’ll look forward to reading them! I think I may record a podcast about some of the lessons learned in the next few days while a lot of this is fresh on my mind. We are clearly living in the GOLDEN AGE of book publishing. It’s hard to describe in words how enthused I was to have this uploaded to both Amazon and B&N, and then today when I learned it was finally available/online on Amazon! I still haven’t heard anything on my Apple iConnect account, but I’m sure eventually I’ll get that approved. I’ve decided to deal directly with Apple rather than work through LibreDigital. Hi Wes… I never consider Pages in this and always looked at taking a Word document and modifying it. Pages is better… I will look there. Thanks for the tip!